With True Grit, The Coen Brothers proved that the Western genre was an absolute fit, and Western tinged flicks like O Brother, Where Art Thou? and No Country For Old Men cements that very fact. With The Ballad of Buster Scruggs, however, the filmmakers traverse new territory in the streaming world, as this flick will make its debut on Netflix. 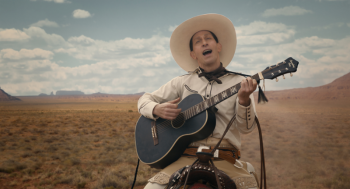 Although it will play in select theaters, most viewers will be catching The Ballad of Buster Scruggs on Netflix. The project was also initially fashioned as a six episode anthology series but Joel and Ethan Coen reshaped it as a feature film. Starring Tim Blake Nelson, James Franco, Liam Neeson and Tom Waits, the feature has received mixed reviews but it did win Best Screenplay at the Venice Film Festival. Franco has the funniest moments in the trailer. Check out the trailer and feel free to comment below! The Ballad of Buster Scruggs hits Netflix and theaters on November 16.